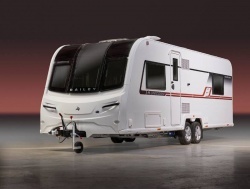 The BAILEY UNICORN SERIES 4 has arrived. The update brings with it, many enhancements, new features and substantial changes in style, layout and design. 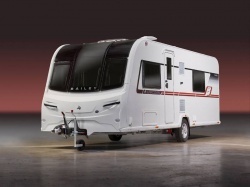 Replacing the Senator range some years ago, the Bailey Unicorn caravan range became an immediate success and it's popularity has continued, with over half the Bailey caravans sold being from the Unicorn range. With Bailey strengthening this range even further - we can only expect the new Unicorn Series 4 range to become even more popular than ever. The Bailey Unicorn Range is the UK's best-selling premium caravan range and Bailey have increased it to include no less than ten models, providing a phenomenal amount of choice, options and layouts to suit all your needs. BODYSHELL - Unicorns are supplied with a 6 year transferable bodyshell integrity warranty and a 3 year transferable manufacturers components warranty. The Alu-Tech bodyshell is a patented aluminium external framework that clamps the bodyshell panels together. As a result there are fewer external joints making the shell more weatherproof. Thicker panels provide significantly better insulation keeping you warm in the cold and cooler in the summer. CHASSIS - All Unicorn Series 4 caravans are built with an AL-KO one piece galvanised steel chassis, braking system and running gear. 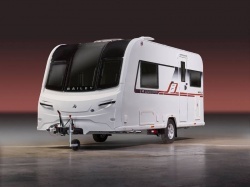 AL-KO are the market leading manufacturers of caravan chassis and complementary premium accessories. AL-KO ATC TRAILER CONTROL SYSTEM - An anti-snaking system for caravans. ATC monitors for instability, making every journey you take safer and more controlled. ATC Trailer Control supports responsible driving and towing ensuring that in any critical or dangerous situation you may encounter, you have the maximum chance of a safe recovery. Even in less extreme situations, such as inclement weather or being caught in the air stream around HGV’s, vans and coaches, ATC gives you the confidence to drive past the oncoming danger. TRUMA SOLAR PANEL - a 100 watt solar panel mounted on the roof helps provide energy by charging up your battery for free. Keeps your leisure battery charged without any effort and doesn't rely on your memory! ( including the first 3 months subscription fee ). SUNROOF - A new double glazed polyplastic opening sunroof complete with night blind is included in the front dome. TV AERIAL - Supplied with a Vision Plus Status 550 telescopic directional TV aerial. 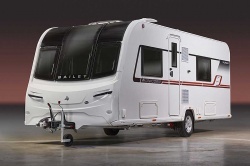 a) Furniture throughout the caravan now shows-off Bailey's 'Eucalyptus' finish and this is combined with chrome finish fixtures and fittings. A nice touch to the furniture is the inclusion of soft closing drawers and doors - particularly handy at night as it will reduce the risk of disturbing someone who is already sleeping. b) The aircraft style overhead lockers have split level storage and soft close metal hinges reducing noise when closing. c) The Unicorn's now have a large 2-drawer front chest with a handy, slide out occasional table. The drawers are soft closing reducing noise. SEATING / UPHOLSTERY - The front sofas now have angled backrests and seat ventilation boards to enhance heating efficiency. The domestic style sofa seating features premium quality fabrics, high density filling and a superior foam construction giving enhanced comfort. The new standard fabric pattern is called 'Brompton'. The Unicorn's come with co-ordinating curtains, bolster cushions and scatter cushions. BED MAKE-UP - Nothing to do with blush or eyeliner - the easy bed make-up system ( an array of wooden slats ) has easy glide tracks and helps transforming the front lounge area into a sleeping area so much easier and practical. ALDE RADIATOR HEATING AND WATER HEATING SYSTEM - The Alde Hydronic Compact 3020 programmable radiator heating system with combined water heating and washroom panel radiator. SHOWER CUBICLE - A single piece, fully lined, domestic style shower cubicle that is fitted with the very popular EcoCamel shower head. The shower is now fitted with a bi-fold door for improved access. It also has an innovative ceiling mounted pull down hanging rail on the shower hood. CASSETTE TOILET - NEW exclusive Thetford C-260 cassette toilet with remote header tank. ENTERTAINMENT - Branded DAB Radio / CD / MP3 Player with USB connection point & bluetooth capability. Connected to dual cone stereo speakers for superior sound quality. REFRIGERATOR - All single axle models have Dometic 134 litre tower refrigerators. 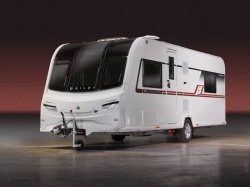 All twin axle models have the larger Dometic 190 litre fridge and freezer. All refrigerators have electronic ignition. OVEN AND GRILL - A Thetford Caprice combined oven, grill and hob with electronic ignition and flame failure device. The Thetford hob is dual fuel with an electric hotplate and 3 gas burners. MICROWAVE - A stainless steel 800 watt microwave oven. WORKTOP - There is a drop-down / flip-up kitchen worktop extension for when extra kitchen work room is needed. Bailey have also made the hob lid so that it doubles up as a worktop surface. The worktop is in a new 'Basalt Stone' finish. AL-KO ATC TRAILER CONTROL SYSTEM - an anti-snaking system for caravans. ATC stands for Automatic Trailer Control. 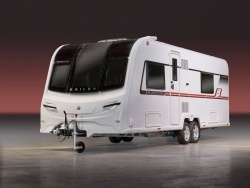 It’s an electronic anti-snaking system for touring caravans. The anti-snaking device helps the driver of a towing vehicle handle unexpected driving hazards such as braking traffic and crosswinds from overtaking vehicles. STABILISER - AL-KO AKS 3004 stabiliser. AL-KO AKS Stabilisers suppress small swinging and pitching movements when towing, providing a safer, more comfortable driving experience. WHEELS - the laser balanced wheels are fitted with premium brand tyres and anti-tamper WSL safety bolts. SECURITY - High security one-key operation throughout. CRiS identity number anti-tamper labels attached to windows and inside the gas locker. Concealed security data chip within the caravan construction. ALARMS - Smoke alarm. Carbon monoxide alarm.